We’re experiencing a real life experiment on how tariffs and trade wars are bad for an interconnected global economy. Tariffs can gain political traction because they are supposed to create or protect domestic jobs. However, as soon as other countries imposed their own tariffs, it generally just comes back to bite the industries that initially were supposed to be insulated. For a developed nation like the US, a trade war would probably result in something like a 3% decrease in GDP. That’s a big deal when you’re talking about trillions of dollars, but it’s also not catastrophic. On the other hand, tariffs can be extremely detrimental to the growth of emerging market economies. iShares MSCI Emerging Markets ETF (NYSE: EEM) is an extremely popular ETF for trading a basket of emerging market stocks. The heavily traded EEM does almost 70 million shares per day in share volume plus 400,000 options on average. As you can see from the chart below, emerging markets have taken a pretty big hit lately. EEM started trending down when tariffs became a major news item. Since the actual implementation of the tariffs, it has dropped even lower. However, a massive options trade last week in EEM suggests that the ETF is done falling for the rest of the month. This trade, known as a put ratio spread, involved a 100,000 by 200,000 put spread – which is about as big of an options trade as you’ll ever see. More specifically, a trader purchased the June 29th 42.5 puts 100,000 times (with the stock at $43.50) while simultaneously selling 200,000 of the 42 puts in the same expiration. Now, buying a put spread is normally a bearish strategy, but the trader actually collected a credit of $0.06. That means if EEM stays where it is or moves up, the position will generate $600,000 in profit. The max gain is at $42 on expiration, where the trade would earn $0.56 or $5.6 million. However, below $42 in EEM is where the risk comes in. Every $1 below $42 would result in roughly $10 million in losses. 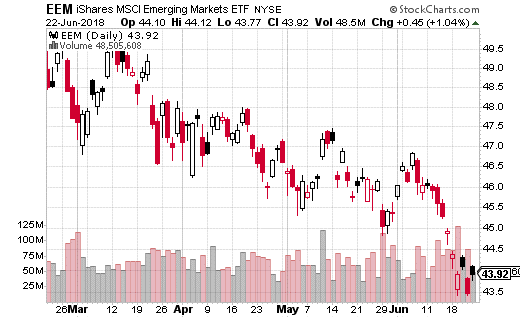 Clearly, there’s big money betting on EEM staying above that level through the end of June. I like the idea of this trade, but obviously not the risk involved. In fact, selling a put spread is tough in general because the options are so cheap. I think you may be better off betting on a reversal straight up using a call spread. For instance, with EEM at just under $44, you could buy about a month of time and get the July 20th 44-46 call spread for about $0.70. Break even is $44.70, you can make $1.30, and max risk is just the $0.70 you pay in premium. That’s a very reasonable amount to pay for a month-long trade that has 185% max gain upside.